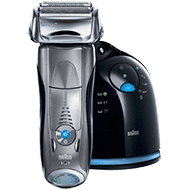 The Panasonic ES-RT51-S shaver is the affordable solution for men who are seeking the perfect shave but don’t want to pay for a fancy casing or cleaning unit, or cleaning cartridges. The Panasonic ES comes in a white and black casing, and has an easy-grip rubber side and back, so you don’t drop it. It can be used wet, but works dry too. It’s a cordless and rechargeable shaver model. 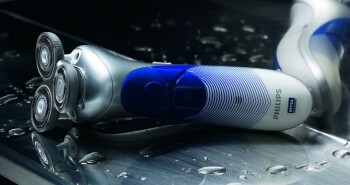 You can use the Panasonic ES-RT51-3 shaver either wet or dry. Shave under a running tap, or take it into the shower with you. It can be used with shaving gels, foams, and creams as it’s 100% waterproof. You’ll enjoy a smooth pampering shave in the shower or bath. 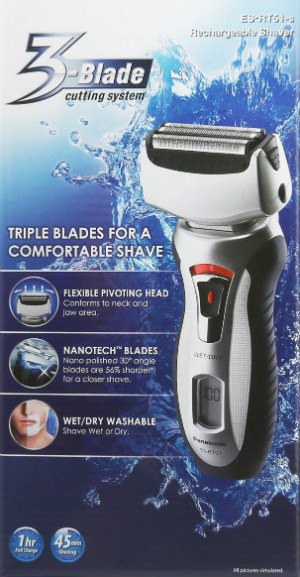 You won’t find too many cordless shavers at this price point that have a flexible pivoting head. 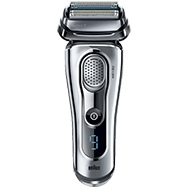 The Panasonic ES-RT51-S 3 has a foil head that pivots and moves as you shave. This allows the shaver head to move and adapt to the contours and turns of your jawline, cheekbones, and chin line. While you’ll get a great shave when using this shaver wet, you’ll also get a great shave if you choose to shave dry. Sometimes you’re just too busy to wet it up and add shaving gels. It’s also a great option for keeping in your bag or briefcase so that you can do touchup shaving as you go. 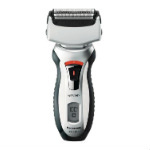 You’ll achieve full use out of this dual purpose shaver. You may even wish to purchase a second one as it’s quite affordable at just under $55. It works great for travel too. It’s also simple to clean. The LCD screen indicator will show a warning when you should pay extra attention to this detail. All you have to do is rinse it under the tap and shake dry. This is recommended if you intend on shaving with skin care products, to ensure that nothing jams up inside. it’s 100% waterproof, so that if you accidentally drop it in the sink or shower, the inner mechanics won’t be damaged. 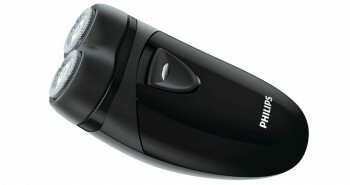 The Panasonic ES-RT51-3 shaver has a foil style type of head, and has a black light up on and off button. Just underneath this button is an LCD liquid crystal display that tells you how much battery charge is left. It lists five different stages as your battery charge gets lower, and warns you when you need to plug it in for charging again. It will also notify you when it’s completely charged up and ready to go. 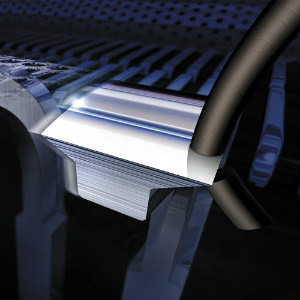 The Panasonic ES-RT51-S 3 is built with Nanotech blades that are installed at a thirty degree angle. 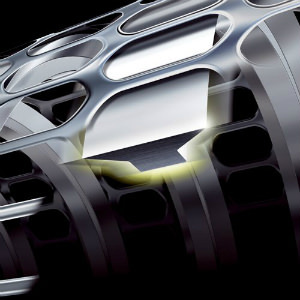 These Nanotech blades are extremely sharp, and the sharpest that Panasonic has to offer in their men’s shavers. These blades are installed on the pivoting head to enable a smooth and close shave right down to the base of the hair, without cutting or scraping delicate skin. Inside the foil head is a three blade cutting system. These blades move independently of each other, with the ultimate purpose of leaving your skin silky smooth, as well as doing it in a speedy length of time. These blades are built within a flexible moving head. 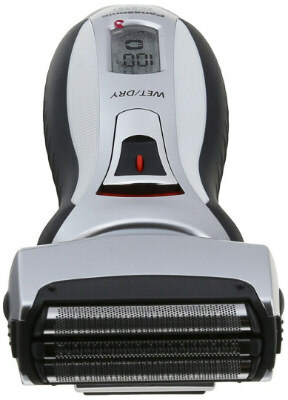 This Panasonic ES-RT51-S 3 men’s shaver runs with a 10,000 RPM motor. This gives it the power to shave the densest, thickest stubble and beards. It keeps it from skipping or being erratic, which can cause an uneven shave, or even to pull and tug on hairs. 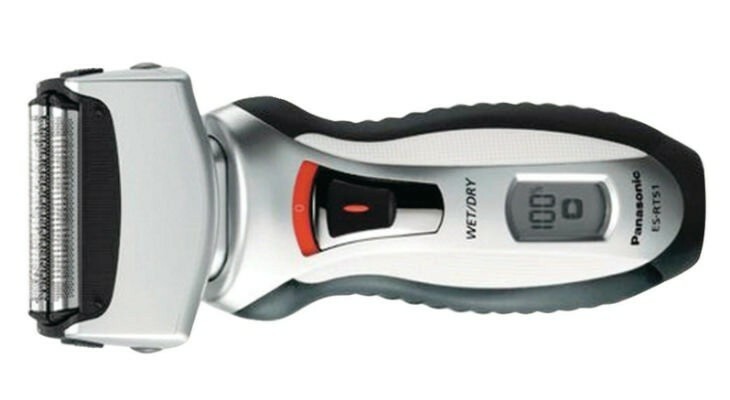 You’ll definitely want to ensure that the shaver you buy has at least the 10,000 RPM rating. 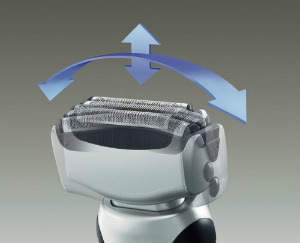 Most men expect their shaver to have a pop-up hair trimmer, so the Panasonic ES-RT51-S 3 has one on the back. Flick it up to trim sideburns, mustache, or beard, then flip it back down again when you’re done. Inside the box you’ll get one Panasonic ES-RT51-S 3 men’s shaver with pop up hair trimmer, a charger cord, and a black drawstring storage pouch. The Panasonic ES-RT51-S 3 measures approximately 6 inches by 1.6 inches by 2.4 inches. It weighs only seven ounces, making it light and easy to hold, even when you need to spend several minutes in the morning getting a complete shave. The Panasonic ES-RT51-S 3 is backed up by a two year warranty, which is fairly standard when purchasing men’s cordless shavers. This covers defects in materials or workmanship, but does not cover regular wear and tear or careless damage. In order to keep the Panasonic ES-RT51-S 3 in perfect running order, it’s recommended to replace the blades and foil at least once a year. Some women with thicker hair may not find the lady’s shavers to their liking, or hate the pink colored casing, so the Panasonic ES-RT51-S 3 will work well to shave lady’s legs as well. You’d be surprised as just how well the Panasonic ES-RT51-S 3 works at trimming hair on legs and under arms. 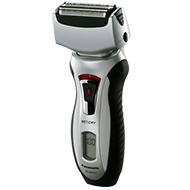 You may wish to buy a second shaver, as men may find that their shaver wears out faster if their partners are using it too! It’s not known whether Panasonic made this razor to be unisex. While not all men’s razors may suit women, the Nanotech blades and pivoting foil style head on this razor seems to work well for women as well. If you’ve been cringing at some of the men’s shaver prices, particularly for a pivoting head-styled one, you’ll be pleasantly surprised at how well the Panasonic ES-RT51-S 3 gives you a perfect shave in the morning. Use it wet or dry. It’s simple to clean, and perfect for travel. Unless you had your heart set on a Panasonic model with the cleaning and charging system, this lone cordless shaver will keep your face looking good.